You may have seen something about this or maybe even thought of doing it yourself, but if you haven't and "Trash the Dress" is a completely new concept for you, then listen up because I'm about to rock your socks! Trash The Dress is a phrase that is used when referring to "trashing" your wedding dress after the wedding day is all said and done. Many people shutter at the thought, thinking "I just spent upwards of $5000 or more on my **BEAUTIFUL** dress and you want me to do what with it?" I mean, I get it. Dresses are not cheap and you may want to save it for your daughter when the time comes and that is totally cool but let me give you the complete lowdown on how it works before you totally shoot down the idea. 1. You never ever ever ever ever... **EVER** have to actually trash your real wedding dress for this session. 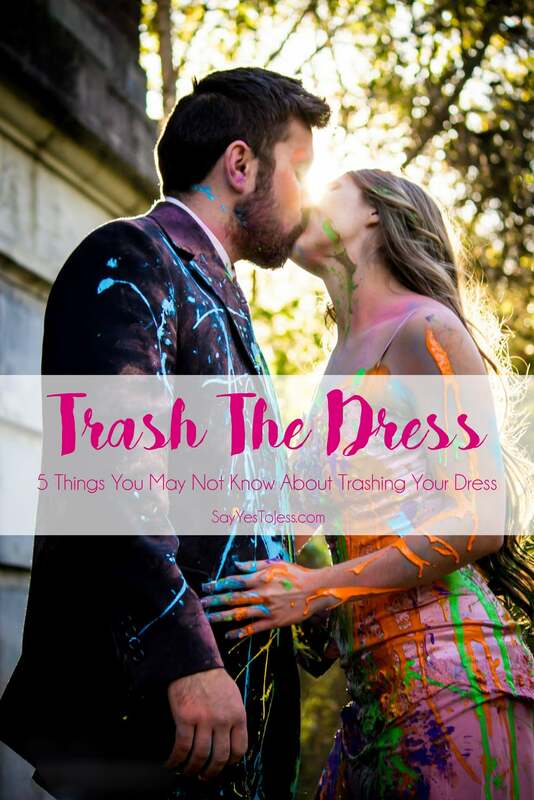 Yes, no one ever said that your real wedding dress is the dress you have to trash. Recently I had a couple who wanted to do this but definitely didn't want to ruin the designer gown she had gotten and again, I don't blame her that dress was STUNNING! Solution: they gathered old prom outfits from back in the day and had one hell of a glorious paint fight. She even brought her actual wedding dress so we could get more photos of them together in places that were a little more outside the box than we could on her actual wedding day. 2. There are multiple ways of "Trashing your dress". Jumping into water - Ocean, big pool, river.... up to you. Into dirt bikes and 4-wheeling? Go mudding! Run a 5k with your dress on that involves paint, color dust, foam or mud- Spartan race anyone? Something fun to also keep in mind for those of you who have a dress from a past marriage, I like to call those "Pre-games", can use this dress and go crazy with it! 3. This is for everyone. Not just the newly married. You don't even have to wear a dressy clothing. Tee shirt and jeans, no problem! As long as your cool with trashing it then lets let the paint fly! Also, if you decide a white t-shirt is what you want to wear, you my friend, will have an awesome souvenir to keep forever! This is also a fantastic engagement/anniversary photo idea/activity as well! 4. You can do this with literally anyone! - QUICK call up your BFF ASAP! Want to get some images of you and your bestie? Well this is a GREAT way to do it. BFF sessions are super in right now and this is an **AMAZING** one to do with each other. You will not only have fun tossing paint in your friends face but you will also get some amazing shots to hang on your walls and keep forever. You can even do this as a family- a family that throws paint at each other stays together... that didn't rhyme but hey, that's ok. I once had a mom offer to do this to her son for his senior photos. I must say it was a pretty glorious moment for her and we filmed the whole thing ;). It's safe to say he had fun as well! 5. It is a **GREAT** way to bond and is genuinely fun! It doesn't matter if you're young or old. Throwing paint, playing in mud, jumping into a pool is just pure fun and if you bring someone with you that you care about it's a great way to bond with them and share an amazing experience together. It could even be a super fun first date ( BAM! You're welcome!). Who would have thought that throwing a little paint on your boyfriend/Friend/Sister/Son/Etc could bring you closer together? So I have 4 questions for you! Have you ever done a Trash The Dress session? If not, what is stopping you? Would you trash your dress? Who would you do this with if given the chance? Tell me in the comments below! I'd love to hear what you have to say! P.s - Pro Tip: Bring spare clothes and trash bags! You're going to need them. Interested in a Trash The Dress session? Click here to book it! Purple hair 101- Rocking that unnatural hair color.